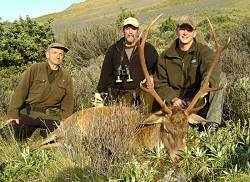 The most popular hunt that we sell in New Zealand is for the famed Red Stag. Alpine Red Hunting will provide an opportunity to take not only some of the South Islands finest free range Red Stags, from 8 to 14 points, in the beautiful and pristine environment of the Seward Kaikoura Range of Mountains, but also an additional female Red Deer Hind to take home for meat as well. about our Alpine Red Trophy Hunt - Red Stag and Hind Combo package. The accommodation is nothing fancy but rather a purpose built cabin right in the middle of the hunting area. The ranch hut has six bunks, hot and cold water, a flushing toilet and a shower. Hunters' partners will enjoy seclusion and spectacular views. The property is ideally suited to Black Powder and Bow Hunting as well. You will not be limited to just Red Deer. If you harvest the 2 animals included in your all-inclusive package there is an opportunity to add additional game animals as well. See our photo gallery for Alpine Red Hunting. The price for a trophy Chamois Buck is just $1,6000.00 USD, for a Wild Boar or Trophy South Pacific Goat it would be just $350.00 USD. Complimentary small game hunts are available for Rabbits, Possums and Hares. We can provide easier country for more mature hunters. For the more ambitious adventurer we have country steeper then a hen's face with views that will make your knees knock.